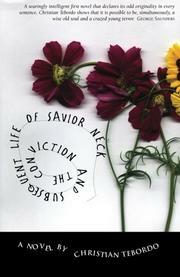 First novel about a man, dead for most of his years, who gets a new lease on life by being condemned to death. In the depressed upstate New York town of Discord, things aren’t going well for the protagonist. At story’s start, young Savior Neck (or at least, “the boy” who seems later to be Mr. Neck), wakes up in a state of nonlife: “I awoke to the smell of withered flowers doused in gasoline,” coming to the conclusion that “I am a dead man.” Now, nobody really wants to hang around a dead guy, as witnessed by the awful reactions people have to his offensive odor, apparently one of the reasons that when we’re flash-forwarded into the future, Mr. Neck is a stumblebum drunk who lives above one of Discord’s lower-end drinking establishments, the same one inhabited most days by his unloving father. The book’s title and apparent purpose seem to derive from Neck’s hassling by the local cops, led by Officer Longarm, treatment that leads to his sentence of death for some extremely vague charges, a sentence in turn that then seems to reverse Neck’s tendency of being dead. Now that he’s slated to die, he seems to feel newly alive. This theoretically interesting conundrum, however, doesn’t scintillate as much as it should: all the existential window-dressing the author displays still takes a backseat to some very ill-advised and difficult to parse noir homage/satire messing about, with characters named Penny Dreadful, Richie Repetition and the like mucking up the works and taking the focus away from Neck’s unique problem. Tebordo has some wit and snap to his writing, and a commendably light connection with reality—this is less upstate New York than an all-purpose free-association zone—but it’s difficult to find a hook in all of the gallimaufry. A purported existential black comedy that falls apart in sideshows and distractions.